Survey Savvy: Is it worth it? Survey Savvy? What is it and is it worth my time? As a full-time college student with a part-time job I still need extra income. So I am always on the lookout for alternative ways to make money. 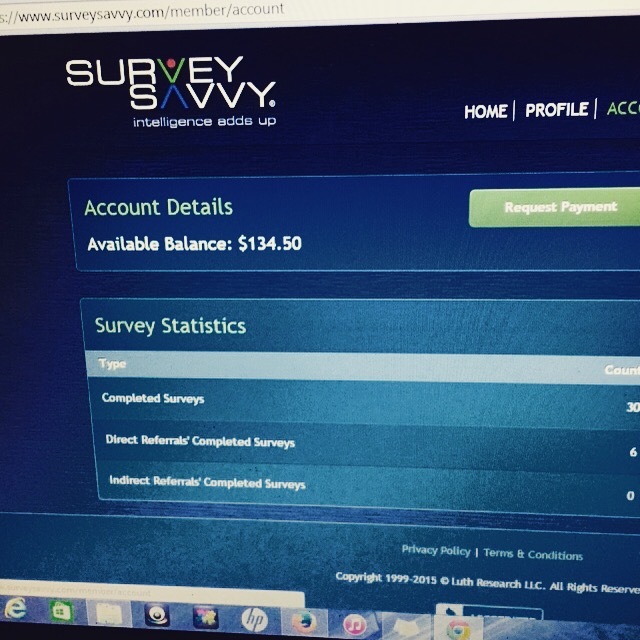 One of the best websites I found to make this supplemental income is Survey Savvy. Why? Well, unlike many other sites (i.e. Cash Crate, Inbox Dollars, or Swagbucks) you won’t find yourself in a whirlwind trying to qualify for surveys that earn you as little as $.10. The minimum you will receive from a survey is $1.00 and there is no maximum limit. Most of the surveys range from 10-30 minutes but usually you don’t even need that much time. The surveys aren’t exhaustively long and tedious unless they have a much higher payout. You also won’t find yourself spending 20 minutes trying to qualify for surveys, if anything you will spend 20 minutes qualifying and earning. 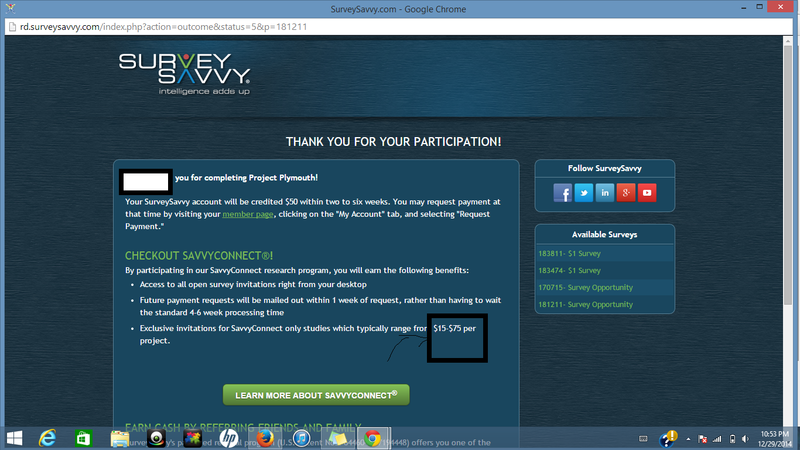 Survey Savvy’s surveys usually take about 2-3 minutes to let you know if you qualify or not. If the survey is taking longer than those 3 minutes that means you’re either pretty close to qualifying or you already did. They also have “projects” which is also another way of saying bigger payout. These projects can award anywhere from $15-$100. The amount you make on Survey Savvy is dependent on your personal demographics and how often they match market researchers specified population. 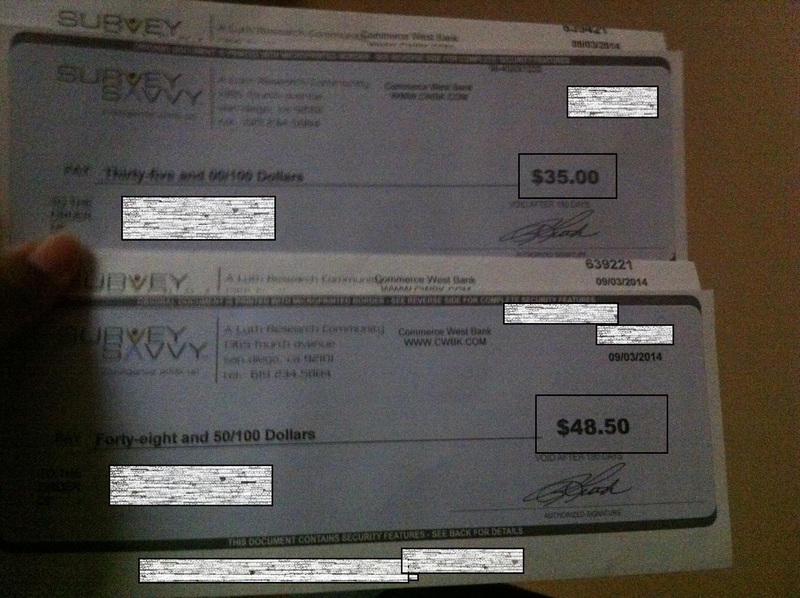 I’ve been an active member of Survey Savvy for two years and my earnings have totaled over $200. I cashed out in August and my payments from then until now is at $134.50. I also have Savvy Connect installed onto my computer, phone, and tablet. Savvy Connect is basically a program that monitors your internet behavior on your computer, phone and/or tablet. This program instantly qualifies you for more paid survey opportunities and gives you faster access to surveys. This is entirely optional but if you’re comfortable with it you can earn up to $60 for installing the program for 90-days straight. I received $40 in increments of $10 every 3-4 months. Be aware of the surveys that don’t pay! Always keep your eyes open and look at whether the survey has a cash incentive or not. I noticed some surveys once completed are only worth having your name in a raffle and to me that is not worth 15 minutes of my time. *After qualifying and completing the survey it can range anywhere from 2-6 weeks. Be aware that this isn’t fast cash but it is good cash. How often will I receive surveys and how often will I qualify for surveys? *Since these are market researchers looking for a specific population there is no way to tell. I just know it’s much more difficult for a teen to qualify than it is an adult. Why isn’t my payment showing? *If it’s been 6 weeks and your payment isn’t showing contact Survey Savvy with the survey ID number and notify them immediately. Where can I learn more about Savvy Connect? Do you have payment proof? Where can I look at my total earnings? How do I know if I’m going to receive my reward? After qualifying and completing the survey, the page normally looks like this. This is how you know will you receive your payment soon. So apparently Qmee does not work when the Ebates toolbar is plugged in. So you can either have qmee and ebates on different web browsers or you can earn cash back by going through ebates and shopping through their links. Just a heads up. I missed out on some good opportunities because of it. This site is great is you’re saving up for a new car, home, wedding, trip, or something else entirely. You can go to their website and see who their partners are and how match $ their matching up for specific dealerships, hotels, cruises, and etc! You can receive up to an additional $500 to purchase a new car! Sign-up, download their Savvyconnect program to whichever devices you choose, and wait to fill out surveys. Once you qualify for surveys you almost always receive a $ incentive…which you will see on the sidebar. I love this site because the surveys are very straight to the point and you cash incentives are added to your account in 2-6 weeks. You can request your payment at $1 and this is the site where I have made the most money. You also won’t receive any junk mail, just emails from them alerting you if you have a new survey where you can earn $! Receive $5 for signing up, get paid to read emails, watch videos, take surveys, search, and refer others. You can request a payment at $30. Get a $1 for signing up, very similar to Inbox Dollars except you can cash out at $20. If you shop online this site is perfect for you!!! Download their toolbar onto your web browser and be alerted whenever you can receive cashback when shopping online. 9) Ownza: Ownza.com another site to earn cashback! Cashout at $10. Register, see if you qualify, and if you do receive $10 after one week of installing their program onto your computer and smartphone. Receive $5 for the following week, and $5 every month after. It’s free easy money! 11) User testing: I found this online and it seems legitimate. I’m undergoing the selection process and will find out within in a week if I qualify but as the screenshot says earn $10-$15 per test! What an easy way to earn some extra cash! 12) Poshmark: USE MY CODE BKHUJ to receive $5 when signing up. I absolutely love this app. If you have a closet full of unwanted clothes, shoes, accessories, handbags, and etc… you can sell them at Poshmark. It’s super simple! Just download their app and review the instructions. It takes less than 60 seconds to put something up for sale. You can also browse other users and see what they’re selling and even trade. If you’re a shopaholic this is the site for you. 15) Shop online? Use retailmenot.com . This site has promo codes that could save you money. I always go to this site and ebates whenever I shop online. 16) Vindale Research: Great Affiliate Program. Not so great survey site. If you have interests in specific categories let me know! I will do a detailed post on how to make money in one of the categories listed below.